This is possibly the greatest thing I have ever seen, in cake form. 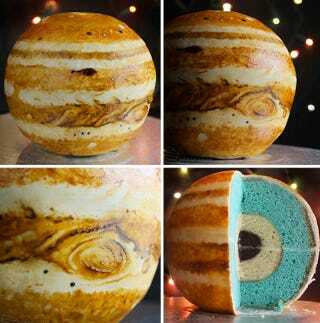 It's a scientifically-accurate planet cake, complete with actual inner layers that make a beautiful cutaway diagram just like you used to bake in your geophysics of cooking courses. Look! Earth even has a magma layer. These cakes were created by Rhiannon from Cakecrumbs, and she's even created a special tutorial video so you can make any planet or asteroid you want. I'd like a Europa cake, with a crispy white sugar-ice crust and a chocolate-dark ocean beneath, with a nice red velvet core. Actually, I have no idea how a true cake geologist would translate Europa's ocean and core into dessert, but chocolate and red velvet just sound so good.